Barbara Santich is Professor Emeritus in the History Department and a culinary historian who initiated post-graduate courses in food history and culture at the University of Adelaide. She is the author of eight books including the award-winning Bold Palates: Australia’s Gastronomic Heritage (2012). The Original Mediterranean Cuisine is both culinary history and cookbook, with 70 recipes from fourteenth- and fifteenth-century Catalan and Italian manuscripts, adapted for today’s kitchens. Starting with the natural and cultural affinities of Mediterranean Europe, such that a medieval merchant from Italy could be understood in Marseille and Barcelona, it demonstrates the culinary similarities that differentiated this region from northern Europe. Originally published in 1995, this new edition has been extensively revised and enlarged by a third and is lavishly illustrated with images from medieval texts. It includes new sections on the medieval table and table manners, and discusses the significance of the medieval banquet through a selection of menus. 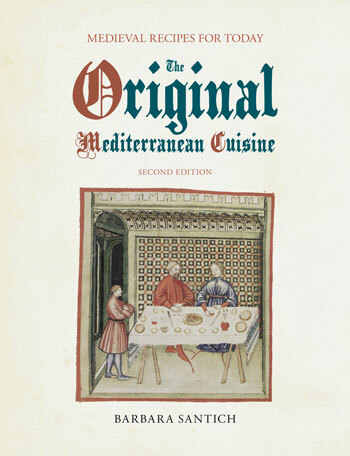 The Original Mediterranean Cuisine is both culinary history and cookbook, with 70 recipes from fourteenth- and fifteenth-century Catalan and Italian manuscripts, adapted for today’s kitchens. Starting with the natural and cultural affinities of Mediterranean Europe, such that a medieval merchant from Italy could be understood in Marseille and Barcelona, it demonstrates the culinary similarities that differentiated this region from northern Europe. The revised and enlarged introductory text, lavishly illustrated with images from medieval texts, includes new sections on the medieval table and medieval table manners, and discusses the significance of the medieval banquet through a selection of medieval banquet menus. 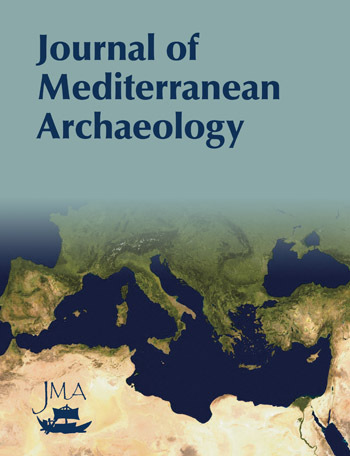 Mediterranean Europe, from Sicily to the south of Spain, shared a similar and agriculture, as well as a cultural and linguistic heritage from the Roman Empire. The cultural revival of the eleventh century, together with the growth of towns and the resurgence of trade, set the scene for a culinary revival. Like clothing, food carried a powerful message; symbolic values were vested in ingredients, methods of preparation, garnishes and embellishments. Parallel to the social hierarchy was a hierarchy of foods, cooking methods, condiments and garnishes. What guests were given to eat and drink, how much of it and what kind, was as clear an indication of their exact place in the hierarchy as their distance from the host and his table. When Pope Jean XXII entertained visiting church dignitaries at Avignon, he offered them fresh pike, transported all the way down the Rhône from Lyons or further north – a voyage that doubled their value, both real and symbolic. The culinary revival in Mediterranean Europe owes much to the influence of Arab civilisation. Translations of medical and dietetic texts from Arabic to Latin and vernacular languages encouraged the development of culinary literature. Spices were the hallmark of medieval cuisine. Exotic luxuries from distant lands, they included spices used by earlier Greeks and Romans as well as new spices from Asia. The basics of medieval Mediterranean cuisine were meat and poultry, fish and seafood, vegetables and herbs, fruit and nuts, plus cheese, pasta and rice. Most cooking was done over or in front of an open fire. The basic utensils in a well-equipped kitchen were pots, frying pan, a roasting spit and a mortar and pestle. Depending on the wealth of the household, the table might be set with gold or silver, pewter, ceramic or wood, with drinking vessels possibly of glass, but the absolute essential was the tablecloth. The standard meals were dinner and supper. Banquets were special meals, often ceremonial, and often conceived to display the wealth and status of the host. A selection of banquet menus, or bills of fare, demonstrate the extravagance and opulence of some of these banquets. With diners often obliged to share plate and cup, dining etiquette was particularly important. Codes of manners from Mediterranean Europe extend beyond basic precepts of hygiene to respect for the honour and comfort of fellow diners. The earliest extant medieval recipe collections date from about the beginning of the thirteenth century. Over the next two hundred years, as recipes were copied and re-copied, they became more detailed and more explicit. Medieval recipes call for certain ingredients that might be unfamiliar in a modern kitchen but are easily prepared. The Original Mediterranean Cuisine is both culinary history and cookbook, with 70 recipes from fourteenth- and fifteenth-century Catalan and Italian manuscripts, adapted for today’s kitchens. Starting with the natural and cultural affinities of Mediterranean Europe, such that a medieval merchant from Italy could be understood in Marseille and Barcelona, it demonstrates the culinary similarities that differentiated this region from northern Europe. Originally published in 1995, this new edition has been extensively revised and enlarged by a third and is lavishly illustrated with images from medieval texts. It includes new sections on the medieval table and table manners, and discusses the significance of the medieval banquet through a selection of menus. There are a relative few number of medieval cookbooks on the market today, making Santich's title an important addition to the small amount of literature on the subject. 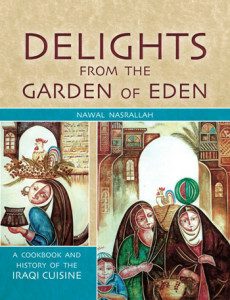 Blending culinary history with recipes adapted for today's cooks, this traces trends in early Mediterranean cooking styles and provides a range of dishes as examples. A book to be placed both on the history shelves and on the kitchen table. One of the best books yet to appear for cooks with an interest in early (and often distinctly different) recipes. The format in which the recipes are presented is impeccable. The adaptation is given first, so that the cook who is simply interested in a usable recipe need go no further; for those interested in what the original recipe really said (or purists who wish to cook the recipe without any "adaptation"), the original follows, with a translation by its side. Further comments on the dish, including suggested variants, and, sometimes, explanations of why the original recipe was not followed more closely, come at the end. When the adaptation does not exactly match the base recipe, there is usually obvious justification: many of these recipes occur again and again in different collections, and variants from a different version are often preferred. A concise and clear introduction to what we know of medieval Mediterranean cuisines... This is well done and the recipes... are well presented. This book is a feast for mind and mouth.